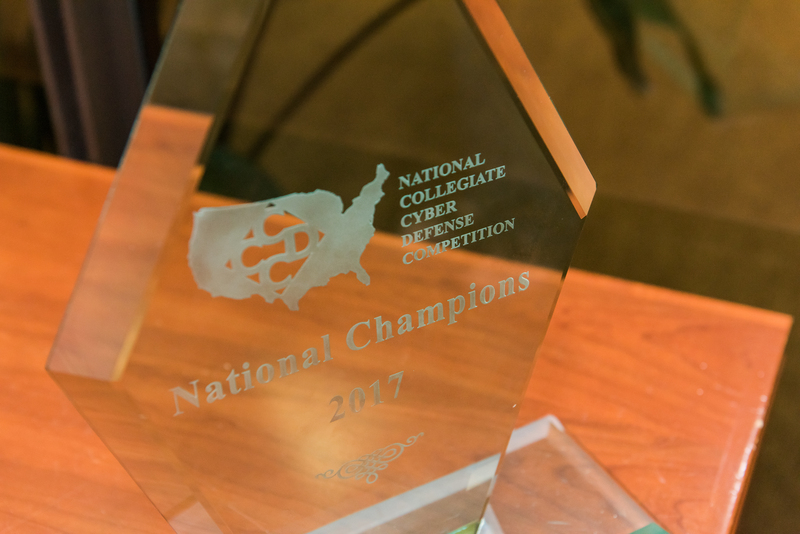 The UMBC Cyber Defense Team took first place at the 2017 National Collegiate Cyber Defense Competition held in San Antonio, Texas this past weekend. The team defeated nine other regional winners from across the country in a contest to protect their networks from cyber attacks and threats efficiently and effectively. Cyber Dawgs’ faculty advisor Charles Nicholas, professor of computer science and electrical engineering, calls the win “my proudest moment at UMBC.” He explains that the competition puts the team in a realistic situation that requires them to use resources and rely on their colleagues and teammates in challenging situations. During 14 hours of competition over two days, the teams are not able to interact with their coaches. Eight students used a dozen pieces of equipment throughout the tournament to keep the services on their network accessible and make sure that the systems are not brought down by hacks or cyber attacks. Leading up to the national and regional tournaments, the team spent hours training, studying, and reviewing scenarios that they might encounter during the competition. They prepared and practiced counterattacks to combat attacks from the other teams. In early April, the Cyber Dawgs placed first in the Mid-Atlantic Collegiate Cyber Defense Competition, and solidified their spot in the National Collegiate Cyber Defense Competition. The Cyber Dawgs beat teams from Towson University, the University of Maryland, College Park, and Drexel University during the regional competition. The Cyber Dawgs have been featured in The Daily Record, Technical.ly Baltimore, and Texas Public Radio.